This 2019 Toyota RAV4 LE is offered to you for sale by Kendall Toyota Alaska. Want more room? Want more style? This Toyota RAV4 is the vehicle for you. You've found the one you've been looking for. Your dream car. The look is unmistakably Toyota, the smooth contours and cutting-edge technology of this Toyota RAV4 LE will definitely turn heads. Beautiful color combination with Silver exterior over FB20 BLACK interior making this the one to own! Contact Kendall Toyota Alaska today for information on dozens of vehicles like this 2019 Toyota RAV4 LE. Want more room? Want more style? This Toyota RAV4 is the vehicle for you. When driving an all wheel drive vehicle, such as this Toyota RAV4 LE, superior acceleration, traction, and control come standard. This vehicle won't last long, take it home today. Beautiful color combination with Gray Metallic exterior over FB20 BLACK interior making this the one to own! This outstanding example of a 2019 Toyota RAV4 LE is offered by Kendall Toyota Alaska. This Toyota includes: 50 STATE EMISSIONS MUDGUARDS (PPO) REAR CARGO AREA COVER Cargo Shade *Note - For third party subscriptions or services, please contact the dealer for more information. * Want more room? Want more style? This Toyota RAV4 is the vehicle for you. Stylish and fuel efficient. It's the perfect vehicle for keeping your fuel costs down and your driving enjoying up. Enjoy driving? Well now you will get more thrills behind the wheel thanks to the heightened performance of AWD. Better handling. Better traction. Better driving experience. This 2019 Toyota RAV4 LE is offered to you for sale by Kendall Toyota Alaska. This Toyota includes: 50 STATE EMISSIONS MUDGUARDS (PPO) REAR CARGO AREA COVER Cargo Shade *Note - For third party subscriptions or services, please contact the dealer for more information. * Want more room? Want more style? This Toyota RAV4 is the vehicle for you. Stylish and fuel efficient. It's the perfect vehicle for keeping your fuel costs down and your driving enjoying up. This vehicle has an added performance bonus: AWD. It improves handling on those winding back roads, and gives you added safety and control when driving through wet and snow weather conditions. This outstanding example of a 2019 Toyota RAV4 LE is offered by Kendall Toyota Alaska. This Toyota includes: 50 STATE EMISSIONS BLACKOUT EMBLEM OVERLAYS (PPO) MUDGUARDS (PPO) REAR CARGO AREA COVER Cargo Shade *Note - For third party subscriptions or services, please contact the dealer for more information. * Want more room? Want more style? This Toyota RAV4 is the vehicle for you. Save money at the pump with this fuel-sipping Toyota RAV4. When the Toyota RAV4 LE was created, it was automatically enhanced by having the performance ability of all wheel drive. Not only will you notice improved steering and superior acceleration, but you can also rest easy knowing that your vehicle comes standard with increased stability and safety. Contact Kendall Toyota Alaska today for information on dozens of vehicles like this 2019 Toyota RAV4 LE. Want more room? Want more style? This Toyota RAV4 is the vehicle for you. Why spend more money than you have to? This Toyota RAV4 will help you keep the extra money you'd normally spend on gas. Enjoy the grip and control of AWD performance in this nicely equipped Toyota RAV4. Just what you've been looking for. With quality in mind, this vehicle is the perfect addition to take home. This outstanding example of a 2019 Toyota RAV4 LE is offered by Kendall Toyota Alaska. This SUV gives you versatility, style and comfort all in one vehicle. Everyone hates the gas pump. Skip a few gas stations with this super fuel efficient ToyotaRAV4. Navigate through all the icky weather with ease in this AWD-equipped Toyota RAV4, and even get non-stop traction for your non-stop lifestyle! In addition to the amazing traction control, you may even qualify for an insurance reduction with this AWD vehicle. There is no reason why you shouldn't buy this Toyota RAV4 LE. It is incomparable for the price and quality. Contact Kendall Toyota Alaska today for information on dozens of vehicles like this 2019 Toyota RAV4 LE. This Toyota includes: 50 STATE EMISSIONS ROOF RACK CROSS BARS (PPO) Luggage Rack REAR CARGO AREA COVER Cargo Shade *Note - For third party subscriptions or services, please contact the dealer for more information. * Want more room? Want more style? This Toyota RAV4 is the vehicle for you. Stylish and fuel efficient. It's the perfect vehicle for keeping your fuel costs down and your driving enjoying up. This Toyota RAV4 is equipped with AWD for improved handling. Whether you're faced with inclement weather or just out enjoying the twisting back road, you'll have the grip of AWD on your side. You can find this 2019 Toyota RAV4 LE and many others like it at Kendall Toyota Alaska. This SUV gives you versatility, style and comfort all in one vehicle. Take home this 2019 Toyota RAV4 and enjoy the safety and added performance of AWD. You could keep looking, but why? You've found the perfect vehicle right here. Beautiful color combination with Silver exterior over FB20 BLACK interior making this the one to own! This outstanding example of a 2019 Toyota RAV4 LE is offered by Kendall Toyota Alaska. This Toyota includes: 50 STATE EMISSIONS MUDGUARDS (PPO) REAR CARGO AREA COVER Cargo Shade BODY SIDE MOLDINGS (PPO) *Note - For third party subscriptions or services, please contact the dealer for more information. * This SUV gives you versatility, style and comfort all in one vehicle. Save money at the pump with this fuel-sipping Toyota RAV4. This AWD-equipped vehicle handles well in any weather condition or terrain. You'll benefit from superb handling, improved steering and excellent acceleration. Contact Kendall Toyota Alaska today for information on dozens of vehicles like this 2019 Toyota RAV4 LE. This Toyota includes: 50 STATE EMISSIONS ROOF RACK CROSS BARS (PPO) Luggage Rack MUDGUARDS (PPO) REAR CARGO AREA COVER Cargo Shade *Note - For third party subscriptions or services, please contact the dealer for more information. * Want more room? Want more style? This Toyota RAV4 is the vehicle for you. Stylish and fuel efficient. It's the perfect vehicle for keeping your fuel costs down and your driving enjoying up. Enjoy driving? Well now you will get more thrills behind the wheel thanks to the heightened performance of AWD. Better handling. Better traction. Better driving experience. Contact Kendall Toyota Alaska today for information on dozens of vehicles like this 2019 Toyota RAV4 LE. This Toyota includes: 50 STATE EMISSIONS *Note - For third party subscriptions or services, please contact the dealer for more information. * Want more room? Want more style? This Toyota RAV4 is the vehicle for you. Start enjoying more time in your new ride and less time at the gas station with this 2019 Toyota RAV4. All-wheel drive means peace of mind all the time. This Midnight Black Metallic AWD Toyota enjoys a host offeatures, including exceptional acceleration and superior stability so you can drive with confidence. Contact Kendall Toyota Alaska today for information on dozens of vehicles like this 2019 Toyota RAV4 LE. This Toyota includes: 50 STATE EMISSIONS *Note - For third party subscriptions or services, please contact the dealer for more information. * Want more room? Want more style? This Toyota RAV4 is the vehicle for you. Stylish and fuel efficient. It's the perfect vehicle for keeping your fuel costs down and your driving enjoying up. Few vehicles can match the safety and comfort of this AWD Toyota RAV4 LE. With enhanced performance, refined interior and exceptional fuel efficiency, this AWD Toyota is in a class of its own. This 2019 Toyota RAV4 LE is proudly offered by Kendall Toyota Alaska This Toyota includes: 50 STATE EMISSIONS ROOF RACK CROSS BARS (PPO) Luggage Rack BLACKOUT EMBLEM OVERLAYS (PPO) MUDGUARDS (PPO) REAR CARGO AREA COVER Cargo Shade *Note - For third party subscriptions or services, please contact the dealer for more information. * Want more room? Want more style? This Toyota RAV4 is the vehicle for you. Everyone hates the gas pump. Skip a few gas stations with this super fuel efficient ToyotaRAV4. Once you see this Toyota, you'll quickly see that this is the perfect vehicle for the outdoor junky! You'll even feel relaxed knowing that this All-Wheel drive vehicle will get you to where you are going no matter what may come your way. Also, with this Toyota RAV4's dependable control you'll be able to drive into the sunset without a care in the world! Contact Kendall Toyota Alaska today for information on dozens of vehicles like this 2019 Toyota RAV4 LE. This Toyota includes: 50 STATE EMISSIONS ROOF RACK CROSS BARS (PPO) Luggage Rack DOOR EDGE GUARDS (PPO) MUDGUARDS (PPO) REAR CARGO AREA COVER Cargo Shade *Note - For third party subscriptions or services, please contact the dealer for more information. * This SUV gives you versatility, style and comfort all in one vehicle. Save money at the pump with this fuel-sipping Toyota RAV4. Navigate through all the icky weather with ease in this AWD-equipped Toyota RAV4, and even get non-stop traction for your non-stop lifestyle! In addition to the amazing traction control, you may even qualify for an insurance reduction with this AWD vehicle. This 2019 Toyota RAV4 LE is proudly offered by Kendall Toyota Alaska This Toyota includes: 50 STATE EMISSIONS ROOF RACK CROSS BARS (PPO) Luggage Rack DOOR EDGE GUARDS (PPO) MUDGUARDS (PPO) REAR CARGO AREA COVER Cargo Shade *Note - For third party subscriptions or services, please contact the dealer for more information. * This SUV gives you versatility, style and comfort all in one vehicle. Everyone hates the gas pump. Skip a few gas stations with this super fuel efficient ToyotaRAV4. This vehicle has an added performance bonus: AWD. It improves handling on those winding back roads, and gives you added safety and control when driving through wet and snow weather conditions. Kendall Toyota Alaska is excited to offer this 2019 Toyota RAV4. This Toyota includes: 50 STATE EMISSIONS ROOF RACK CROSS BARS (PPO) Luggage Rack BLACKOUT EMBLEM OVERLAYS (PPO) DOOR EDGE GUARDS (PPO) MUDGUARDS (PPO) REAR CARGO AREA COVER Cargo Shade *Note - For third party subscriptions or services, please contact the dealer for more information. * Want more room? Want more style? This Toyota RAV4 is the vehicle for you. Why spend more money than you have to? This Toyota RAV4 will help you keep the extra money you'd normally spend on gas. Enjoy the comfort and safety of this AWD Toyota RAV4 LE equipped with many standard features found on other vehicles as optional equipment. Kendall Toyota Alaska is excited to offer this 2019 Toyota RAV4. This Toyota includes: 50 STATE EMISSIONS MUDGUARDS (PPO) BODY SIDE MOLDINGS (PPO) *Note - For third party subscriptions or services, please contact the dealer for more information. * This SUV gives you versatility, style and comfort all in one vehicle. Save money at the pump with this fuel-sipping Toyota RAV4. Few vehicles can match the safety and comfort of this AWD Toyota RAV4 LE. With enhanced performance, refined interior and exceptional fuel efficiency, this AWD Toyota is in a class of its own. This 2019 Toyota RAV4 LE is proudly offered by Kendall Toyota Alaska This Toyota includes: 50 STATE EMISSIONS DOOR EDGE GUARDS (PPO) MUDGUARDS (PPO) REAR CARGO AREA COVER Cargo Shade *Note - For third party subscriptions or services, please contact the dealer for more information. * This SUV gives you versatility, style and comfort all in one vehicle. Stylish and fuel efficient. It's the perfect vehicle for keeping your fuel costs down and your driving enjoying up. This AWD-equipped vehicle handles well in any weather condition or terrain. You'll benefit from superb handling, improved steering and excellent acceleration. Contact Kendall Toyota Alaska today for information on dozens of vehicles like this 2019 Toyota RAV4 LE. This Toyota includes: 50 STATE EMISSIONS SPECIAL COLOR ROOF RACK CROSS BARS (PPO) Luggage Rack BLACKOUT EMBLEM OVERLAYS (PPO) MUDGUARDS (PPO) REAR CARGO AREA COVER Cargo Shade *Note - For third party subscriptions or services, please contact the dealer for more information. * Want more room? Want more style? This Toyota RAV4 is the vehicle for you. Save money at the pump with this fuel-sipping Toyota RAV4. Enjoy the grip and control of AWD performance in this nicely equipped Toyota RAV4. Introducing the new Toyota RAV4 at Kendall Toyota of Anchorage! Stylish and bold, this SUV is perfect for drivers of every age. With up to five person seating in the RAV4 you’ll have plenty of room for friends, family, and pets! Got cargo? The Toyota RAV4 has you covered with roomy storage space and an available power liftgate. Available in hybrid, the Toyota RAV4 is available in the Toyota RAV4 LE, RAV4 XLE, RAV4 Limited, RAV4 Premium, and RAV4 Adventure trim levels to choose from. With so many options you’ll have a hard time picking a favorite Toyota RAV4 in Anchorage! You can browse our available inventory of the Toyota RAV4 above. Feel free to contact us with any questions and our friendly team will be happy to assist you. 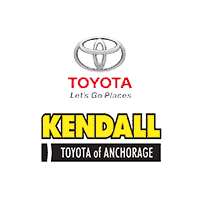 At Kendall Toyota of Anchorage we have a variety of finance options to suit your lifestyle. Your current vehicle can be a thing of the past with Kendall. Simply visit the showroom today and we’ll give you a fair trade-in value! Ready to get behind the wheel of a Toyota RAV4? Come take a ride at our dealership, conveniently located at 6930 Old Seward Highway in Anchorage, Alaska 99518. Also serving Eagle River, Senai, and Soldotna! Your new Toyota RAV4 is waiting! With upgraded suspension, 6-speed automatic transmission, and choice of 2.5L DOHC or 4-Cylinder with dual VVT-i engines the Toyota RAV4 is one athletic SUV. With optional all-wheel drive and standard front-wheel drive, the RAV4 is capable of producing 176hp and 172 pound-feet of torque. You’ll be mapping out new adventures and wondering where you can drive to next! From the roomy interior to the unique S-code paint treatment, you’ll know you made the right decision every time you get behind the wheel of your new Toyota RAV4. Standard safety features include 4-wheel ABS with Brake Assist, driveline traction control, electronic stability control, and fully galvanized steel panel construction. Also included are dual stage driver and passenger front airbags and dual stage driver and passenger seat-mounted airbags. Illuminate any road or garage with LED headlights and daytime running lights. With remote keyless entry you won’t be left out in the cold fumbling with car keys. Wipe away the weather with ease thanks to the Toyota RAV4’s rear window defroster and wiper! Relax on trips to the grocery store and long drives with the Toyota RAV4’s MP3 decoder, CD player, and 6-speaker AM/FM radio. Upgrade your new Toyota RAV4 by adding available front heated seats and dual zone automatic climate control! Also available is the amazing Bird’s Eye View Camera, HomeLink with frameless rearview mirror, and Entune Premium Audio with Integrated Navigation and App Suite. 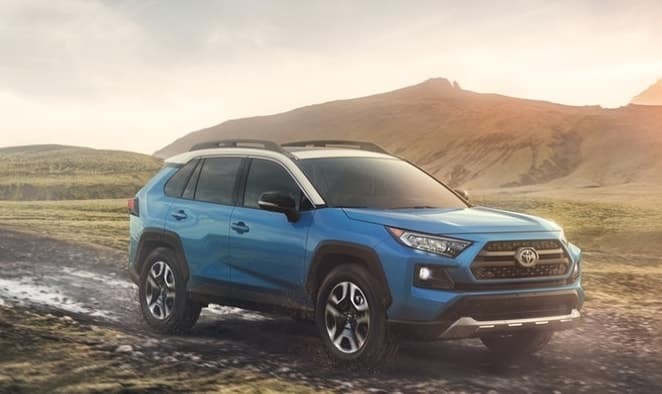 So, come drive away in your brand new Toyota RAV4 at Kendall Toyota of Anchorage- where the only thing you’ll be left asking is where the road will take you next!